The HTU21D-F has a default I2C address of 0x40 and cannot be changed! Place the Adafruit_HTU21DF library folder your arduinosketchfolder/libraries/ folder. You can try breathing on the sensor to increase the humidity. The sensor reacts very fast! 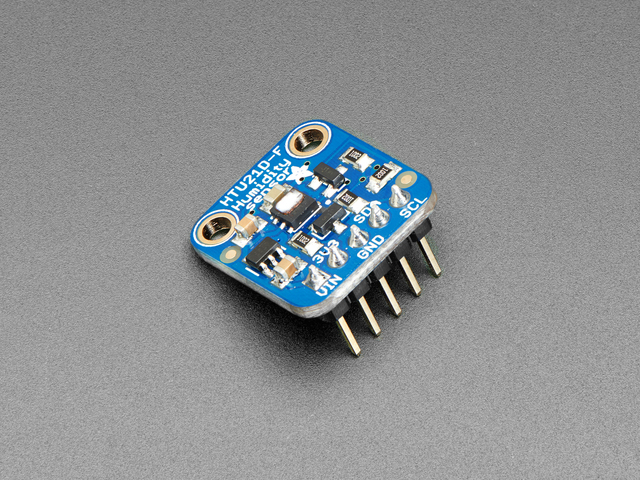 There are no pins to set since you must use the I2C bus! Which will return floating point (decimal + fractional) temperature. You can convert to Fahrenheit by multiplying by 1.8 and adding 32 as you have learned in grade school! This guide was first published on Jun 03, 2014. It was last updated on Jun 03, 2014. This page (Wiring & Test) was last updated on Apr 19, 2019.